An interdepartmental seminar at the University of Washington, focusing on all aspects of optimization. ABSTRACT: In this talk, we show that the recently developed relative smoothness condition can be used for constructing implementable third-order methods for Unconstrained Convex Optimization. At each iteration of these methods, we need to solve an auxiliary problem of minimizing a convex multivariate polynomial, which is a sum of the third-order Taylor approximation and a regularization term. It appears that this nontrivial nonlinear optimization problem can be solved very efficiently by a gradient-type minimization method based on the relative smoothness condition. Its linear rate of convergence depends only on absolute constant. This result opens a possibility for practical implementation of the third-order methods. BIO: Yurii Nesterov is a professor at the Center for Operations Research and Econometrics (CORE) in Catholic University of Louvain (UCL), Belgium. He received his Ph.D. degree (Applied Mathematics) in 1984 at the Institute of Control Sciences, Moscow. Starting from 1993 he works at the Center of Operations Research and Econometrics (Catholic University of Louvain, Belgium). His research interests are related to complexity issues and efficient methods for solving various optimization problems. The main results are obtained in Convex Optimization (optimal methods for smooth problems, polynomial-time interior-point methods, smoothing technique for structural optimization, complexity theory for second-order methods, optimization methods for huge-scale problems). He is an author of 5 monographs and more than 100 refereed papers in leading optimization journals. 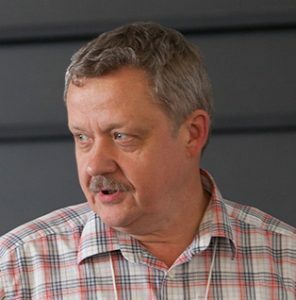 He has received several international prizes, among which are the Dantzig Prize from SIAM and Mathematical Programming society (2000), the von Neumann Theory Prize from INFORMS (2009), the SIAM Outstanding Paper Award (2014), and the Euro Gold Medal from the Association of European Operations Research Societies (2016). In 2018 he also won an Advanced Grant from the European Research Council. This entry was posted in CORE Talks, Spring 2018 on May 16, 2018 by Kellie MacPhee. Click here to sign up for email updates about CORE talks, as well as other optimization events happening around campus.